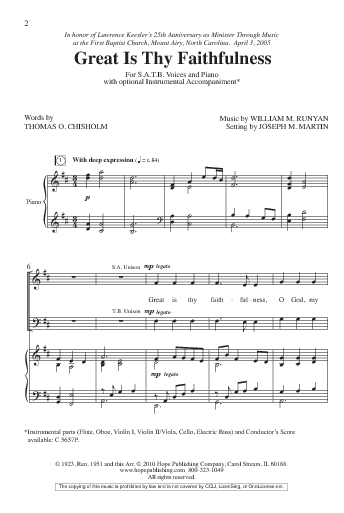 William Runyan was an editor for Hope Publishing Company in 1923 when he composed the tune for this beloved hymn to a text by his friend, Thomas Chisholm. The message is a vivid testimony to God’s faithfulness, and Joseph Martin’s dynamic choral setting is a skillful statement of faith in its own right. The accompaniment calls for a small ensemble of instruments that heighten the impact, but may also be done with simply piano. The Instrumental packet contains a Conductor's Score and parts for: Flute, Oboe, Horn, Violin 1, Violin 2/Viola, Cello & Electric Bass.